Why Did You Decide to Become a Dentist? This field combines several of Dr. Sharma’s passions – science, interacting closely with other people, and working with her hands! 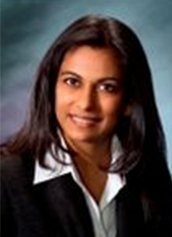 After attending Adelphi University for her undergraduate degree, Dr. Sharma chose to pursue her Doctor of Dental Medicine at Tufts University School of Dental Medicine. She also completed a General Practice Residency at Waterbury Hospital in Connecticut and is a current member of the American Dental Association. At home, Dr. Sharma and her husband have one son. Her hobbies outside of Andover Family Dental include traveling and rock climbing. In fact, she’s starting to share these hobbies with her son and enjoys doing so very much!